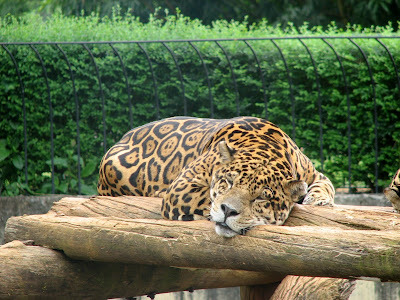 Jaguars are wonderful cats! They are so big and powerful looking. I don't know much about about them, but I always wished that I could see a real one. Jaguars have wonderful fur. All orange and black. I wish I could have a coat like that, but it might be hot in summer, now I come to think of it, it would be very hot indeed. What always amazed me about the big cats, is that the women are the hunters, while the men sleep and laze about. What a life. I think it is unfair for the women as they have to do all the work. I can imagine running through the trees as a jaguar. It would be very exciting. I would be one of the fastest things around and everyone would know it and know to get out of my way. The only problem if I was a jaguar is that I would have to do all the work because I am a girl, and that does not sound fun at all! Would you like to be a jaguar?